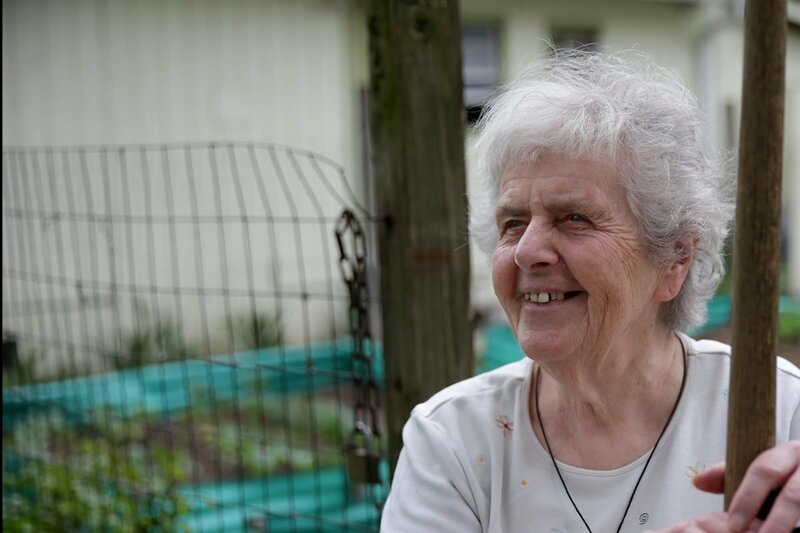 Sister Margaret McKenna’s brown crucifix dangles and dances from her neck as she tills the vegetable garden she’s carved out of the poorest neighborhood in the poorest big city in America. As she works, fat bees float low over the fertile North Philadelphia dirt. Sister Margaret smiles. 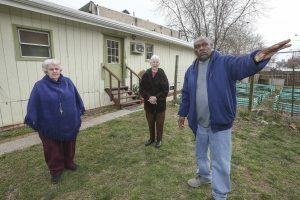 Sister Margaret McKenna, left with Sister Sylvia Strahler, and Gary Robbins discuss the garden at New Jerusalem Now recovery center in North Philadelphia. She might as well be describing herself. Many of the roughly 900 food cupboards in the region that feed the hungry are run by religious women such as Sister Margaret, born before color television, with Jesus in their hearts and comfortable shoes on their feet. The Ph.D. in Christian origins from the University of Pennsylvania displays a photo of the pope on her refrigerator. She once worked as an archaeologist at an ancient temple site in Israel. The North Philadelphia area, including Fairhill and parts of Kensington, ranks among the hungriest in the United States, with 25.9 percent of people living there relying on food stamps, known as federal Supplemental Nutrition Assistance Program (SNAP) benefits. Only nine other places in the country are more SNAP-dependent. Throughout the nation, about 12 percent of people are food insecure — lacking enough food in a year to lead a healthy life, according to data from Feeding America in Chicago, the largest hunger-relief nonprofit in the country. In Philadelphia, it’s 21 percent. In North Philadelphia, food insecurity runs as high as 30 percent. While childhood hunger has remained steady in the United States, it’s tripled in North Philadelphia among families where parents work 20 or more hours a week, according to research by Drexel University Professor Mariana Chilton, director of the Center for Hunger-Free Communities. What is it like to be hungry? To fight hunger, large, local charitable agencies such as SHARE and Philabundance supply the numerous cupboards here with tons of food in a system where need grows yearly. Newly joining the battle, hospitals have begun seeing hunger as a medical condition, writing “prescriptions” for boxes of food, screening patients to learn their level of food insecurity, and pointing them toward help. 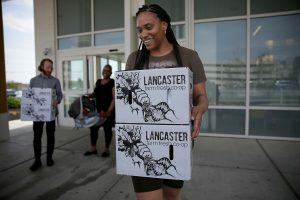 A’lah Bey, 30, of North Philadelphia, carries out food boxes provided by the St. Christopher Foundation at St. Christopher’s Hospital for Children in North Philadelphia. To battle hunger, many hospitals have taken St. Christopher’s lead and have doctors write “prescriptions” for food. Undergirding all efforts is SNAP, run by the U.S. Department of Agriculture and, by far, the most effective solution to hunger in America, advocates say. About 40 million Americans receive average monthly SNAP benefits of about $1.40 a meal. For every meal that agencies such as Philabundance supplies, SNAP provides 12, according to Feeding America. President Trump has said he wants to cut SNAP benefits by at least 25 percent, while Republicans in the U.S. House of Representatives have proposed eliminating 1.2 million monthly recipients, in part by creating work requirements for benefits. 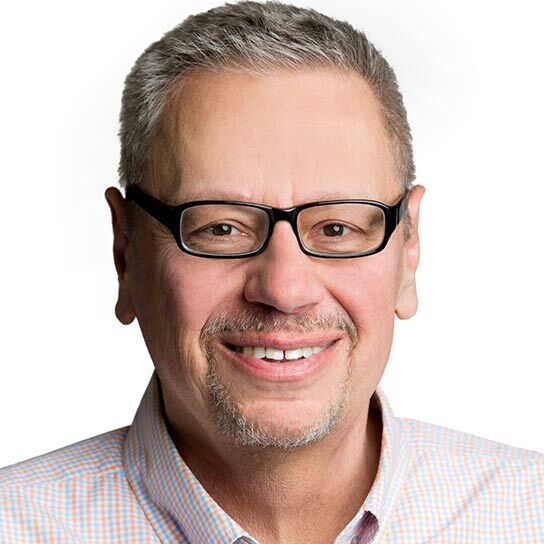 As it happens, said Glenn Bergman, executive director of Philabundance, the vast majority of those who receive SNAP have jobs or are children, elderly, or disabled. “There’s a real lack of understanding of how big a problem hunger really is,” said Kathy Fisher, policy director of the Greater Philadelphia Coalition Against Hunger. People who want to limit SNAP benefits, she added, incorrectly see the hungry as freeloaders. Advocates argue that solving hunger is feasible, if only the national will existed. However, the fixes recommended to bring about a solution — expanding SNAP, boosting wages, giving workers sick leave and family leave, and limiting tax breaks for corporations to reroute funds to people in poverty — are not readily embraced by Congress, state legislatures, or even many citizens. Meanwhile, hunger persists. And people such as Sister Margaret cultivate a garden in the cityscape. 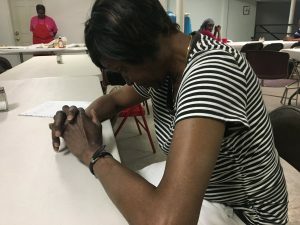 “If not for Sister Margaret and New Jerusalem food, I’d be in deep trouble,” said Evelyn Harville, a 76-year-old widow who supports two out-of-work children and a grandchild. Harville, who worked all her life — most recently as an X-ray technician — said Social Security is inadequate to keep her family out of poverty. And that riles her. “It’s demeaning to live in the United States and to have to stand in a food line, especially when you worked and paid into the system,” she said. “My mother didn’t raise bums. By the third week of the month, Philadelphia gets hungry. People are starting to run out of SNAP benefits because the allotment is too small, Mariana Chilton’s research shows. That’s the hard time, say residents who show up to eat free lunch on Wednesdays in the bright white basement of Devereux Methodist Church on West Allegheny Avenue. “There’s short patience by the 21st or so,” said director Thelma Kennerly, 66. Rebecca Farmer, 62, says grace before eating a free lunch at Devereux Methodist Church in North Philadelphia. She says she retired too soon and now faces hunger. “You see hunger in the way people eat,” said Mildred Perkins, 78. “People gobbling it up,” agreed Denise Hawkins, 61. “And all the children take adult portions,” Kennerly concluded. Throughout the state, hospitals are screening people to learn their level of hunger. Many are prescribed discounted boxes of produce by doctors. “Our data is just coming out now and Philadelphia is worse than we predicted,” he said, explaining that his group places food insecurity at about one in four people in the city. 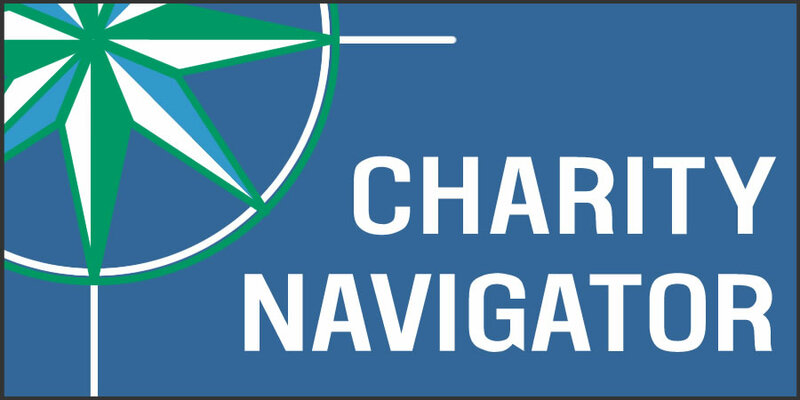 Coordinated by the Hospital & Healthsystem Association of Pennsylvania in Harrisburg, the effort was initially tried by the St. Christopher’s Foundation for Children at St. Christopher’s Hospital for Children in North Philadelphia. Michael Consuelos, senior vice president for clinical integration at the association, said that about 7,000 Philadelphians have recently been asked about hunger. “We are never going to affect obesity, heart disease, and diabetes if we don’t deal with the lack of healthy food in the home,” said Saba Khan, a pediatrician at Children’s Hospital of Philadelphia, part of the association’s research group. Children who are food insecure are twice as likely to be in poor health, studies show, and face the potential stunting of their physical, cognitive, social, and emotional development. Chilton said it’s not just the poor in Philadelphia who advocates must deal with; it’s the rich who have to get involved. As advocates argue, the hungry do without. “You know, I was hungry as a kid,” said Tinze Jones, the hospital worker and North Philadelphia mother of three. “I vowed never to be in a line for food. But now I always am.